Bachelor of Medicine and Surgery from the University of Brussels (ULB) and specialist in Internal Medicine (October 1988 to September 1993). She obtained the diploma of Doctor of Medicine, Surgery and Births with mention of great distinction in July 1988. Her training as a professional is oriented to Internal Medicine, Endocrinology and Gastroenterology, as well as adult and pediatric emergency medicine. 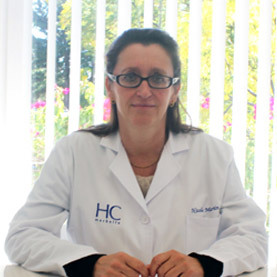 She presented her doctoral thesis in September 1993 with the research: Helicobacter pilory and its implications in pathologies of the upper digestive tract “. Since 1993, she has been conducting internal medicine consultations with approval of the Personal Recognition Specialist title by private insurances. From 2005 to 2010, she was working in the emergency service of the Regional Hospital of Marbella (adult and pediatric emergencies). Illustrious Medical School of Malaga since 1993.